Rolex, Omega, Breitling, and other luxury brands are far from the reach of the majority of buyers. Good thing there’s a manufacturer like Invicta whose collection of homage watches are nothing short of stunning. 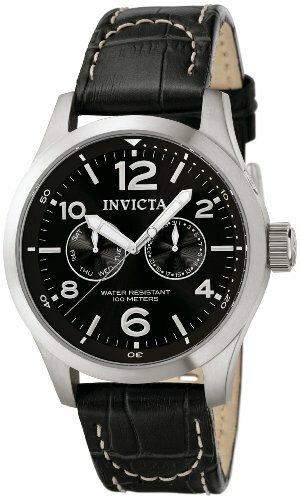 What makes Invicta stand out against the competition is the close resemblance of their watches. Their products are of good quality and available at a very affordable price. These are the main reasons why their brand is so popular among casual buyers and watch collectors alike. Even celebrities who can afford luxury watches like can’t resist the design and durability of Invicta Pro Diver watches. Arnold Schwarzenegger, for one, has been spotted sporting an Invicta watch on one of his interviews. 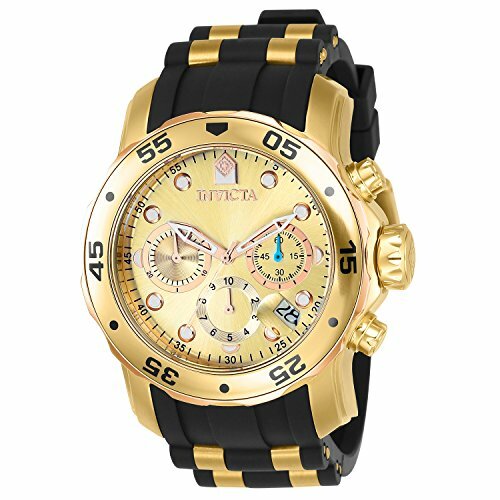 The word ‘invicta’ in Latin means ‘invincible’, which is what the brand continues to manifest in their products. The brand originated from Switzerland under the guidance of Raphael Picard. However, the quartz crisis that occurred in the 1970s almost took the brand out of the market. It was only in the 1990s when Invicta resurfaced, continuing their history of producing high-quality watches with inexpensive price tags. 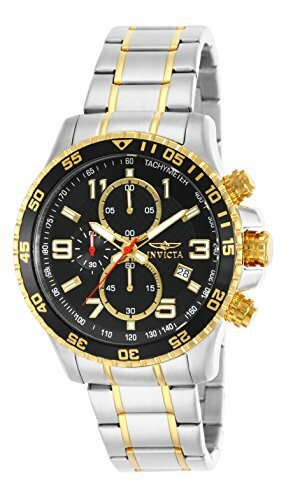 There may be hundreds of Invicta watches out in the market that it can get confusing which of them you should look into. 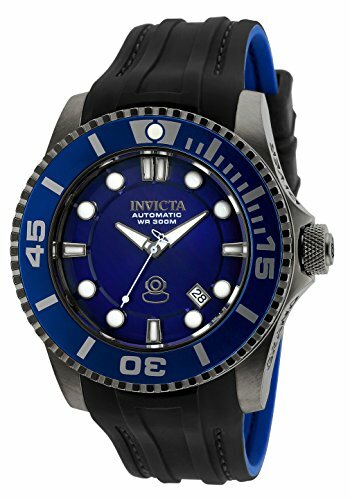 With this, we’ve decided to make an Invicta Pro Diver review to help you select which of them are suited for water activities. Here are the best Invicta dive watches you can find in the market. An incredible sapphire blue that drives home the notion that this is a piece is a sea dweller and would fit the a personality who loves the sea. The 37.5mm Invicta Mako Pro Diver has a stainless steel case and band, a mineral crystal, a unidirectional rotating bezel, luminescent hands and markers, a magnified date window, and a Japanese quartz movement. Simple and very easy to read. If you dont see well and you are looking for something you can easily read then this is the piece for you. The 48mm 0764 has a stainless steel case and bezel, a leather strap, a flame fusion crystal, day and date subdials, luminescent hands, and a Swiss quartz movement. The ideal sports diver for any occasion, not too big, not to small respectable piece offering class and elegance without being too overbearing. 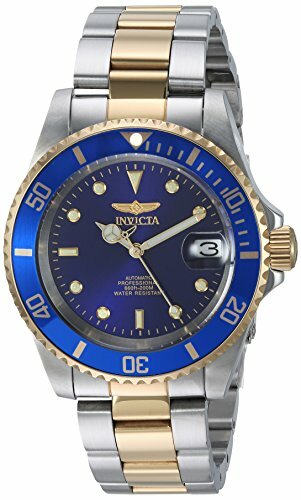 The 37.5mm 8932OB Invicta Pro Diver has a stainless steel case and band, a mineral case, a unidirectional bezel, a magnified date window, luminescent hands and markers, and a quartz movement. 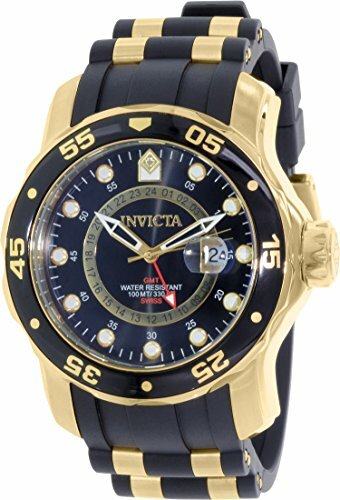 For its price and basic features suited for a diving watch, the 89320B is undoubtedly one of the best Invicta dive watches out there. The 45mm 14876 Specialty Chronograph has a two-tone stainless steel case, bezel, and band, a mineral crystal, a date window, luminescent hands and markers, three chronograph subdials, and a Japanese quartz movement. This “silver stunner” piece is guaranteed to make a loud roaring statement to onlookers. The 45mm 6620 Chronograph has a stainless steel case, band, and bezel, a flame fusion crystal, a unidirectional rotating bezel, a tachymeter on the dial rim, a date window, three chronograph subdials, luminescent hands, and a Swiss quartz movement. 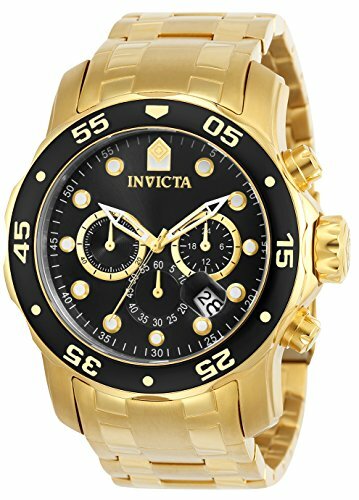 The 49mm 17884 Invicta Pro Diver has a stainless steel case, a gold-toned rotating bezel, a synthetic sapphire crystal, a polyurethane band with gold-toned links, a magnified date window, luminescent skeleton hands and markers, three chronograph subdials, and a Japanese quartz movement. Looking for that classic looking steel sports diver that offers simplicity and goes with just about any outfit? The 40mm 8926OB Pro Diver is the best Invicta dive watch you can get your hands on. This Rolex Submariner homage features a stainless steel case, bezel, and band, a mineral crystal, a unidirectional rotating bezel, luminescent hands and markers, a date window, and a Japanese quartz movement. Incredible design that pays homage to the Rolex two-toned bluesy and is a fraction of the price and guaranteed to make people stare. 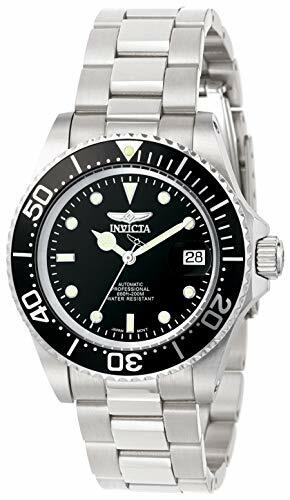 The 40mm 8928OB Invicta Pro Diver watch has a stainless steel case, bezel, and band, a mineral crystal, a corrugated bezel that rotates in one direction only, a magnified date window, an exhibition case back, luminescent hands and markers, and a Japanese automatic movement. 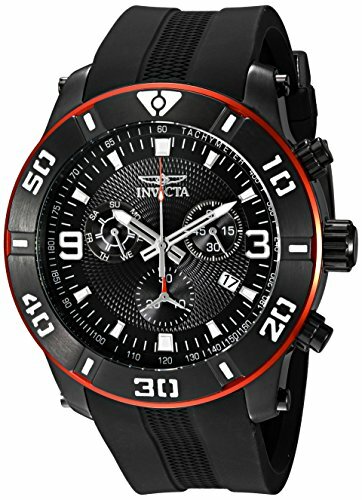 It has a screw-down crown designed for deep diving activities, making this one of the best Invicta dive watches in this list. 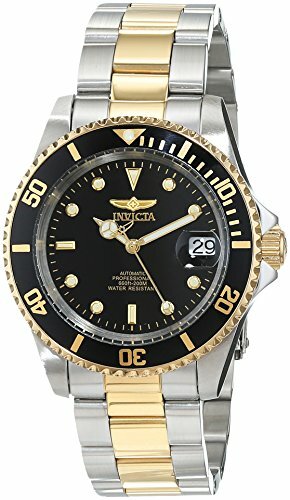 The 48mm 0072 Invicta Pro Diver has a stainless steel case, a black-colored unidirectional rotating bezel, a gold-toned stainless steel band, a flame fusion crystal, a screw-down crown, a stopwatch feature, a magnified date window, luminescent hands and markers, three chronograph subdials, and a Swiss quartz movement. 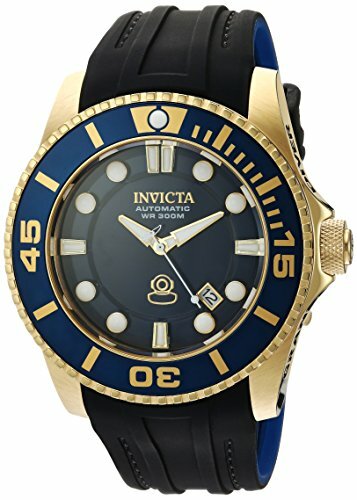 The 50mm 17815 Invicta Pro Diver has a stainless steel case, a date window, a gold dial with two chronograph subdials, luminescent hands and markers, a unidirectional bezel, a synthetic sapphire crystal, a polyurethane band, and a Japanese quartz movement. 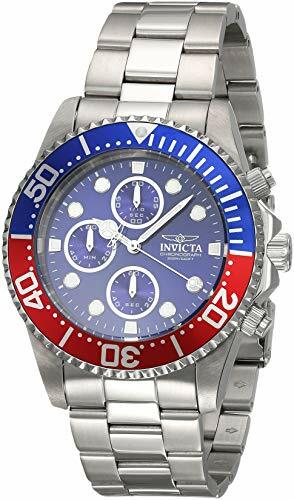 The 48mm 6981 Invicta Pro Diver has a stainless steel case, a mineral crystal, a unidirectional rotating bezel, luminescent hands and markers, a date window, three chronograph subdials, and a Japanese quartz movement. 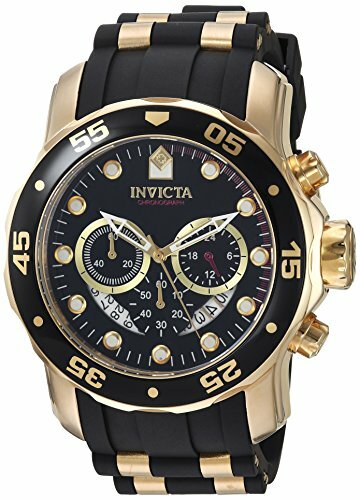 What makes this Invicta Pro Diver watch stand out is its strap that’s made of polyurethane with gold-toned stainless steel insert. 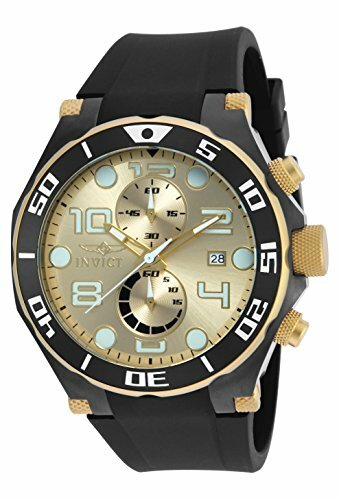 If you love the transformers bumble bee design then you atr going to love the 48mm 6991 Invicta Pro Diver has a stainless steel case, a polyurethane band, a mineral crystal, a unidirectional stainless steel bezel, luminescent hands and markers, skeleton hands, a magnified date window, a GMT hand, and a Swiss quartz movement. The 48mm 17203 Aviator has a stainless steel case and band, a rose gold bezel, a synthetic sapphire crystal, luminous hands, a date window, a slide rule on the rim of the dial, three chronograph subdials, and a Japanese quartz movement. The 44mm 1771 Invicta Pro Diver reminds me of a Rolex sub or a Seiko with their iconic Pepsi design. 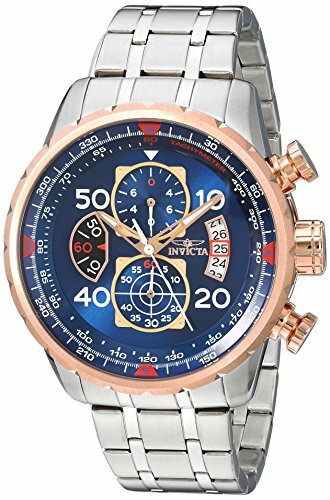 However, this Invicta feaures a stainless steel case, a flame fusion crystal, a unidirectional rotating bezel, luminescent hands and markers, three chronograph subdials, and Japanese quartz movement. The 52mm 20449SYB Invicta Pro Diver has a stainless steel case, a polyurethane band, a two-tone unidirectional bezel, a synthetic sapphire crystal, a date window, three chronograph subdials, luminescent hands and markers, and a quartz movement. The 40mm 8927OB Invicta Pro Diver is reminiscent and a nice homage to a Rolex Submariner. It has a stainless steel case, a mineral crystal, a corrugated unidirectional rotating bezel, a two-toned stainless steel band, an exhibition case back, a magnified date window, luminescent hands and markers, and a Japanese automatic movement. 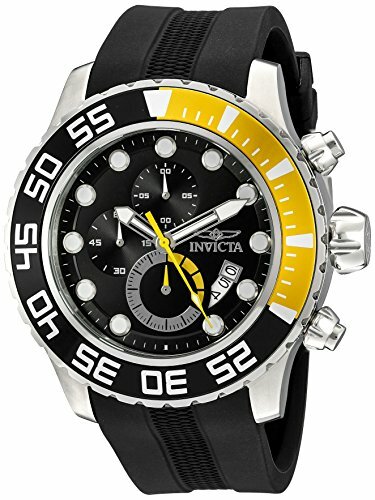 For its price point and features, this is simply one of the best Invicta dive watches in the market. The 49mm 19839SYB Invicta Pro Diver has a stainless steel case, band, and bezel, a two-tone band color, a mineral crystal, crown pushers, a mesh dial, a magnified date window, three chronograph subdials, and a Swiss quartz movement. 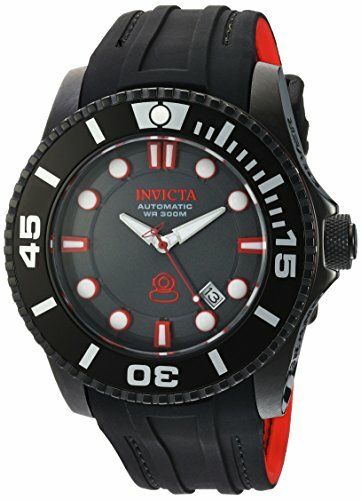 This is one of the most affordable Invicta Pro Diver scuba watches you can get your hands on. 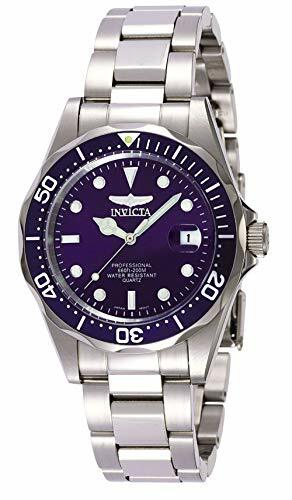 The 48mm 20205 is an Invicta Pro Diver scuba watch that features a stainless steel case and band, a silicone strap, a unidirectional bezel, a date window, a synthetic sapphire crystal, luminescent hands and markers, and an automatic self-winding movement. 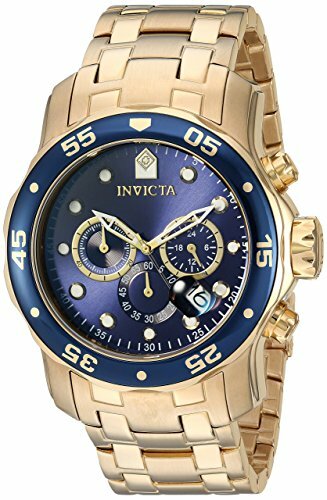 The 48mm 0073 Invicta Pro Diver has a gold-plated stainless steel case and band, a flame fusion crystal, a blue-colored unidirectional bezel, a magnified date window, luminous hands and markers, three chronograph subdials, and a Japanese quartz movement. 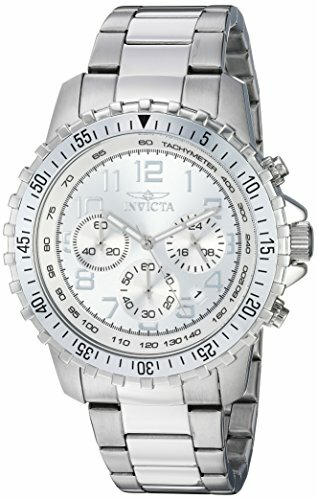 The 50mm 19825 Invicta Pro Diver has a stainless steel case, a polyurethane band, a unidirectional rotating bezel, a synthetic sapphire crystal, a tachymeter rim, crown pushers, a date window, quality luminescent hands and markers, two chronograph subdials, a day subdial, and a Swiss quartz movement. 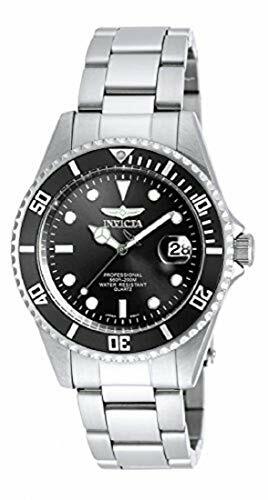 The 46mm 20203 is an Invicta Pro diver scuba watch with a stainless steel case, a unidirectional bezel, a synthetic sapphire crystal, a date window, luminescent hands and markers, and an automatic self-winding movement. The 47mm 20204 has a stainless steel case and bezel, a silicone band, a synthetic sapphire crystal, a date window, a screw-down crown, luminescent hands and markers, and an automatic self-winding movement. The 20204 is one of the few Invicta Pro Diver scuba watches you can find in the market. 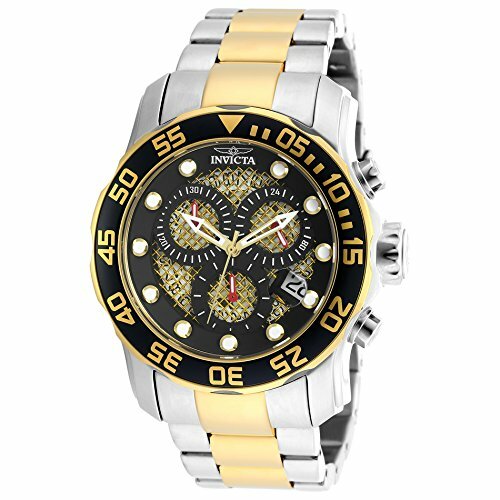 People love Invicta watches for their quality homages and affordable price tag. The Invicta Pro Diver collection, specifically, has all the features you need in a watch designed for diving activities and other water sports. For its quality, price, features, and overall feel, you surely won’t regret getting one yourself.